Want to learn how you can explore New York’s more than 10,000 miles of snowmobile trails this winter? The New York State Snowmobile Association and Grafton Trail Blazers snowmobile club are teaming up with the New York State Office of Parks, Recreation, and Historic Preservation at the Grafton Lakes State Park 30th Annual Winter Festival Saturday, January 24th, for “Take a Friend Snowmobiling” day. The event is a demonstration of the basics of snowmobile operation and ownership. The New York State snowmobile trail system crisscrosses 45 counties through woods, fields, towns and our State Parks. Snowmobiling is a fun, family-friendly way to enjoy winter scenery and wildlife, especially for those with physical conditions or disabilities preventing more strenuous activities like skiing and snowshoeing. The “Take a Friend Snowmobiling” event is a great introduction to the sport for new riders or reintroduction for those who haven’t been on a snowmobile in years, and an opportunity for current snowmobilers to meet and share their interests. Representatives from the New York State Parks Snowmobile Unit, the State Snowmobile Association, and the Grafton Trail Blazers snowmobile club will be on hand to answer all of your snowmobiling questions and provide short demonstration rides, conditions permitting. The event will be held at the playground near the main parking lot from 11:00am to 3:00pm. Necessary equipment will be provided, but participants are urged to dress appropriately for outdoor weather conditions. Anyone age 16 and older is welcome to join (if conditions permit snowmobile operation, youth ages 16-17 must have a valid safety certificate to operate). Another “Take a Friend Snowmobiling” event will be held at Delta Lake State Park on February 8th, with more details to be announced. 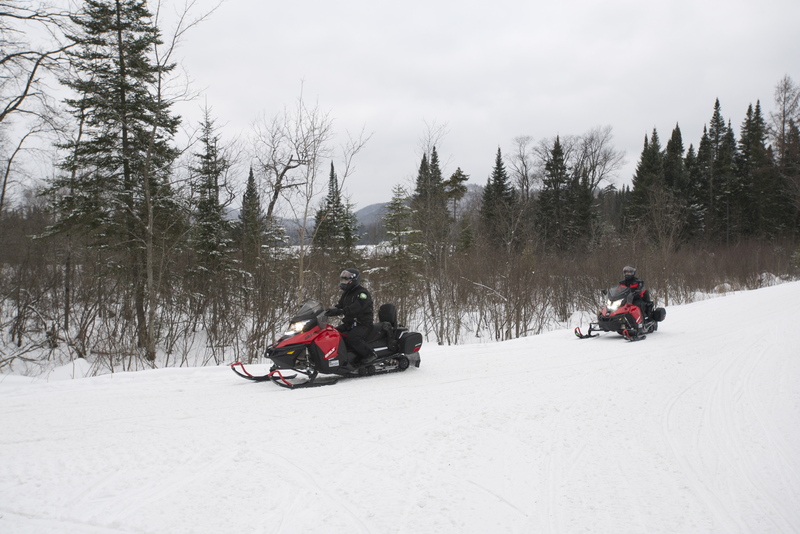 Jim MacFarland and Bennett Campbell from the OPRHP Snowmobiling Unit hit the trails near Old Forge. Click here to view the full Winter Festival schedule of events. Click here for more information on other Take a Friend Snowmobiling events. Click here to visit the NYS Parks website for more information about snowmobiling in New York, including a free Snowmobiler’s Guide. NYSOPRHP recommends all snowmobilers attend a certified New York State snowmobiling safety course, and never drink & ride! Post by Bennett Campbell, photo by John Rozell.